The cost of attending college in the U.S. has been increasing exponentially for some time; last year, student loan debt surpassed $1 trillion. To avoid the high costs of private schools, many choose SUNY schools to avoid private school costs. Now, one of SUNY’s programs has made it one of the best university systems for debt management. SUNY Smart Track, launched in April 2014, is a system-wide program that helps students within its 64 campuses keep their finances and debt under control. This includes a Financial Aid Award letter that comprehensively outlines aid offerings and cost of attendance, as well as an array of tools that help students and their families plan out costs and better prepare for future expenditures. 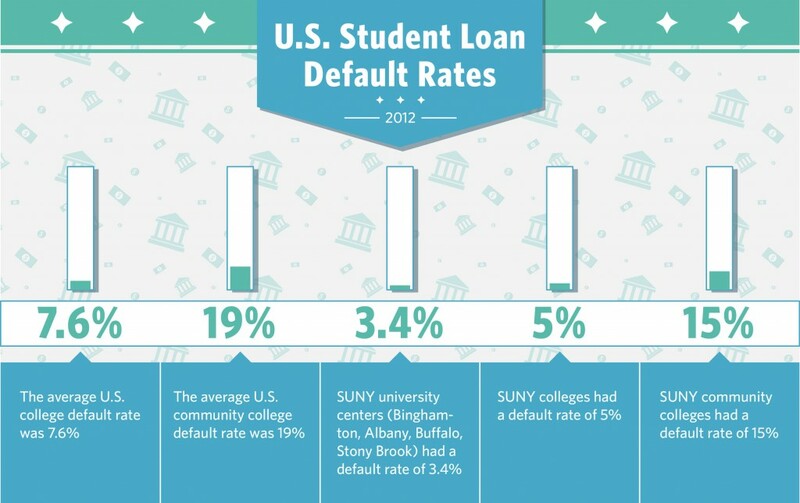 This, combined with approximately 75 percent of full-time students receiving financial aid, has led to SUNY students having a significantly lower default rate on their student loans. According to the U.S. Department of Education, the average percentage of students defaulting on their loans for fiscal year 2012 was 11.8 percent. In the same year, the average default rate for SUNY’s university centers — which includes Binghamton University as well the Universities at Albany, Stony Brook and Buffalo — were 3.4 percent, after steadily dropping from 5.59 percent in 2010, when the national default rate for a four-year college was 9.3 percent. The financial planning tools available for students include Smart Track’s Financial Literacy Tools, which comprises a series of different online tutorials and modules that walk both prospective and current students through a number of financial planning ideas such as “Taxes and You” and “Understanding Insurance.” Another tool offered is the Net Price calculator, which offers a tailored figure to how much a given student can expect to receive in aid and spend throughout college on various things. Thomas Mastro, the president of the SUNY Student Assembly and a BU senior majoring in human development, said the transparency that Smart Track allows is only a small example of the university system’s efforts to aid students. “This federal data only proves what we already knew — that as a result of SUNY’s commitment to affordability, access, completion and success, students are increasingly in a position to graduate on-time and in a stronger position to pay off their loans,” he said in a press release. During a recent visit to the Mohawk Valley, home to a handful of SUNY campuses, Zimpher went on to say that initiatives such as this and SUNY2020 work to advance the quality of education both during and after graduation. “With continued state investment for our campuses in the Mohawk Valley region and throughout SUNY, we will keep doing all we can to ensure that student borrowers are able to finish their degree and graduate without unmanageable loan debt,” she said. The services offered and students’ use of management tools make SUNY stand out as an institution, said Kai Brown, a sophomore double-majoring in economics and Japanese.